So glad the weekend is finally here. What are your plans? At the top of my list is ordering all of my supplies for holiday gift wrapping. I just ordered some washi tape for packaging gifts this year. I still have a large supply from last year but wanted a few more options. I'm planning on using solid colored wrapping paper this year in 3 colors: red, white, and kraft. I am searching for some affordable white butcher paper in small sizes (everything I've found so far is 1000 feet long - way too much!) Anyone know any good sources for this? I am also looking for a great solid red paper in a matte finish. Everything I am finding seems to have a gloss finish. 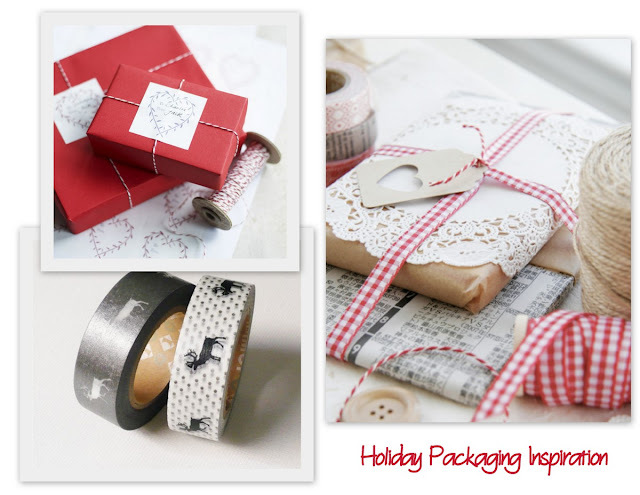 What are your ideas and inspirations for holiday gift wrap this year? Love the idea of using only solids for your wrapping paper this year. My favorite part of gift wrapping is the embellishing, and as much as I drool over designer gift wrap, plain kraft paper is much easier for me to dress up! I completely agree! I am so excited for embellishing all my gift wrapping this year.